Smart connectors in ConceptDraw DIAGRAM now have an auto-routing feature. This means that smart connectors always find the optimal route between objects and automatically recalculate that path when moving these objects. This makes editing of diagrams extremely easy and quick. The feature that permits connectors to avoid objects in its path can be easily disabled by switching off the "Run Around Objects" mode on the Document tab. In this case connectors will run through objects which are in the path of connectors. You can also disable this feature by dragging the connector′s handle, but in this case connectors won′t be following the optimal path. To switch back to the auto routing feature you just need to only move connected objects to switch back to automatic routing. Sample 1. 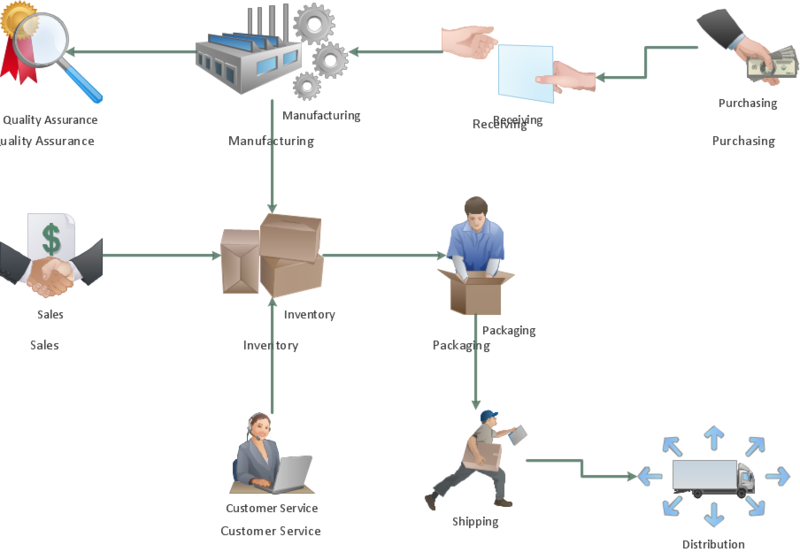 Workflow diagram - Business. Auto-connection mode - This is more than enough versatility to draw any type of diagram with any degree of complexity. How should diagramming software work? Is it possible to develop a diagram as quickly as the ideas come to you? The innovative Auto-connection mode is what you need to start draw. If you want to create professional diagrams quickly but don't know how to start, try a professional tool with Rapid Draw ability. This will let you draw a smart and good looking diagrams and charts using its simple RapidDraw option just in clicks. Take a look on a diagram you are looking for and create it fast and quickly.